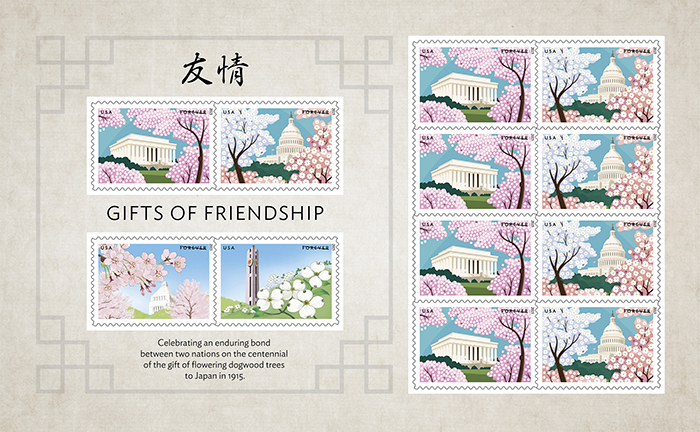 The United States Postal Service and Japan Post are jointly issuing Gifts of Friendship stamps tomorrow, April 10. 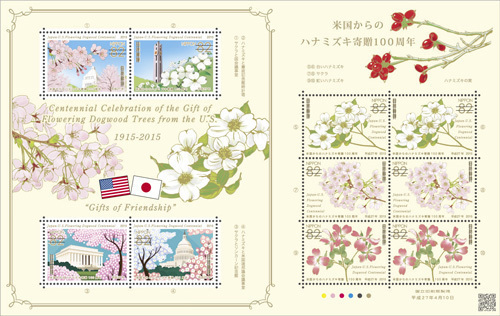 These stamps celebrate the centennial of the gift of flowering dogwood trees from the United States to Japan in 1915. The stamps are issued in a pane of 12 Forever stamps, the left side includes two stamps I designed paired with the Japan Post stamps designed by Junko Kaifuchi. It was an honor to be asked to work on these stamps as a follow-up to the Cherry Blossom Centennial stamps I designed in 2012. Over 150 million of the 2012 stamps were sold, and I hope this joint issue does well both here and abroad. Wonderful work, Paul, and fun to see the color sketches as well. Congratulations, Paul. This is very cool, I am a huge fan of historical postage stamps. I would love to see that Y view ( left side) gigantic and on nice paper. Love these. Congrats. Always a fun feeling to tell the postal worker, "Hey I know this artist!" even as they sometimes blankly stare back.